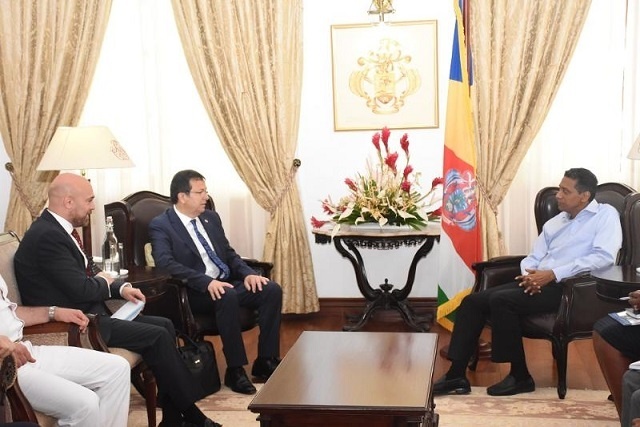 (Seychelles News Agency) - Building ties in the fields of tourism, energy and health are what Turkey is hoping to establish with Seychelles, said the head of the first Turkish delegation ever to the island nation on Thursday. The delegation met with the Seychelles' President Danny Faure at State House in Victoria, the capital. "Energy is a field that we know a lot about and we want to share our expertise with Seychelles. We had some business people in the meeting which had introduced themselves and what they can do," said the head of the delegation, Bekir Kuvvet Erim. Tourism is the top contributor to the economy of Seychelles -- a 115 island archipelago in the western Indian Ocean. In October 2016, Turkish Airlines started operating thrice-weekly flights to the island nation. In December last year, the two countries signed an air service agreement at the annual Air Services Negotiation conference in Nairobi, Kenya. The head of the Turkish delegation added that the visit is a historical one because this is the first time that a diverse delegation including businessmen, parliamentarians and people from the military come to Seychelles. "The main idea is to also hold a business forum in Seychelles in order to develop our economic and trade corporation," said Kuvvet Erim. On his side, Faure expressed Seychelles’ willingness to further develop cooperation ties between Seychelles and Turkey. Trade and military cooperation also topped the agenda during the discussion between Faure and the Turkish delegation. Kuvvet Erim said that he has conveyed an invitation from the Turkish President Tayyip Erdoğan to Faure to visit Turkey. Seychelles and Turkey established diplomatic ties on June 22, 1995.